Size: 5.8" x 3.5" x 1.9"
This EC-300 does not look like a Texas Instruments product and made a great design evolution compared to the earlier EC-200. 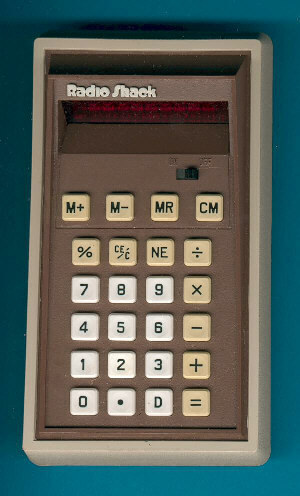 The TI-2550 with similar complexity (%-key and 4-key memory) was introduced later. Maybe TI had a delay in the development of the TMS0601, the direct counterpart of the Western Digital LC1552 used in the EC-300 and the Montgomery Ward P8P. Interesting note: Bowmar used with the MX-55 the same chip for a calculator without memory. The keyboard of the calculator is a mixture of the TI-1500 keys and the grid of the Datamath. Nevertheless, this is the Service Center - maybe TI offered just the repair service for Radio Shack. In 2003 we finally found the answer when we explored the EC-1000, a desktop calculator matching the design line of this EC-300. This calculator looks and feels like a TI product but carries no TI logo inside. The secret of both calculators is a magic number on the printed circuit board (PCB): 13-04-709-479 - read more here. The battery compartment of the EC-300 sports a small sliding switch to select between "RECHARGABLE NI-CD BATTERIES" and "ALL OTHER BATTERIES". This switch prevents the AC-Adapter from providing a charge to the batteries if the switch is set to "aALL OTHER BATTERIES".